(HQT) Health Quest Therapy, Talkeetna is a single service line clinic, providing expert Physical Therapy for adults, and teens. Located in the Sunshine Community Health Center building, we are proud to work alongside the Sunshine Clinics to provide full-time, Physical Therapy service to Talkeetna and the surrounding community. Using the latest therapeutic technologies and best practices, the Health Quest Physical Therapists will work closely with you on your journey back to full physical function. With the ability to draw from a variety of effective treatment modalities, techniques, and technologies the Physical Therapist will develop a unique treatment program tailored to your preferences. Not sure if you would benefit from Physical Therapy treatment? Find out more by downloading our Physical and Occupational Therapy brochure, and learn how Physical Therapy may be your best option to get you back to a pain free life. 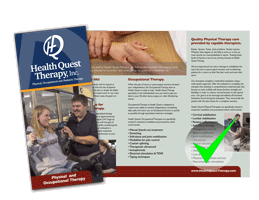 Treatment plans at Health Quest Therapy follow evidence-based practice. Designed to include the necessary time, frequency, and intensity needed to achieve optimum results. We offer a variety of specialized treatment methods and state of the art equipment.